I found these four pink landline phones which to some may think it’s cool, while to others it would just be plain weird and crazy to have. Engadget mentioned two of these in their site. 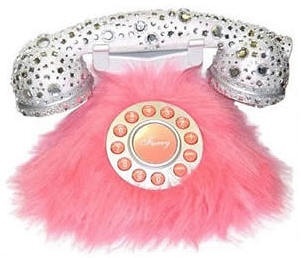 First is the pink fur and rhinestone phone. Engadget didn’t have any details about it so I had to do a search for it. I found that it costs $39.99 at Distinctivetelephones.com. It looks kind of like something from Monsters inc. but still it is kind of cute in a princessy girly sort of way. I found another pink furry phone from Cutie Pie Stuff. Aside from the base, the handset has fur on it also so I think using this would be a bit ticklish. This one is more expensive than the other one at a price of $65.00. Golly gosh. 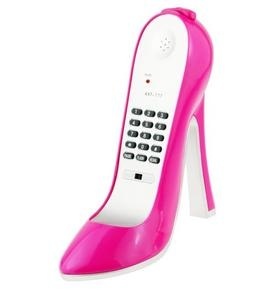 Another phone linked in Engadget is the High Heels Phone costing $22.00 at gadget4all.com. It looks kind of cool for a decor at home, but using it would be kind of weird. Imagine putting a shoe in your ear and talking on it. Weird, eh? Finally, here’s one that I actually do like and might even consider buying one myself. (Do I seem crazy? Oh well.) 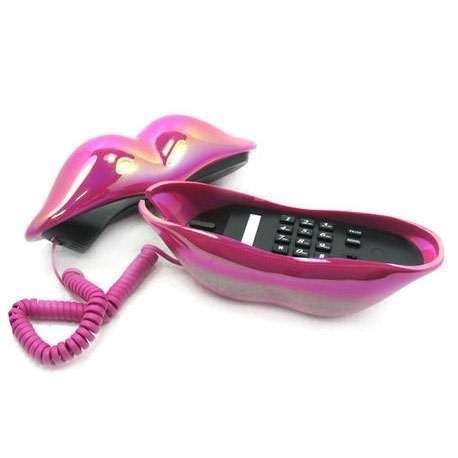 This one is a Pink Lips Phone also from gadget4all.com. It only costs $19.00. It also looks nice as a home decor if you’re the girly/fashionista type. I love that these are all pink, but not all of them are that appealing to have. Yup, interesting though. Update 08/18/2014: Links to merchants above may no longer exist. However, if you want to purchase any of the above phones, a quick Google search may help you. This entry was posted in Gadgets, Tech and tagged Phones, Pink.